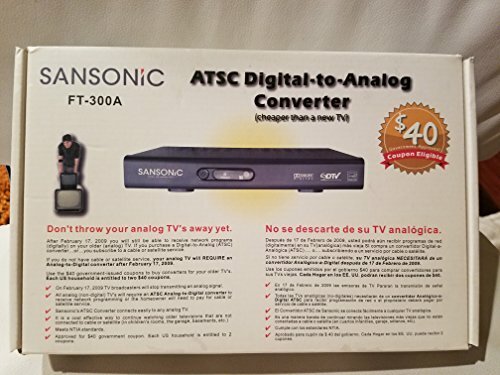 Coupon Eligible digital converter box (CECB) that converts ATSC Digital broadcast signals to Analog (NTSC) allowing an Analog (non-digital) TV to receive Digital broadcasts. The converter processes and displays ATSC programming and system information in 4:3 and 16:9 aspect ratios to fit any TV. It features outstanding pictures quality that provides viewers with a near DVD quality picture and is rated recommended by Consumer Reports. Its compact size makes it convenient to install. Specifications: Receiving and Presenting Audio/Video Formats Contained in ATSC A/53E * Support 4:3 and 16:9 Video Format * Process and Display ATSC A/65C Program and System Information Protocol data. * Receiving RF Channels 2 through 69 inclusive * Include a female 75 ohm F-Type Connector for VHF/UHF Antenna Input. * Include a female 75-ohm F-Type Connector with User-selectable Ch3 or 4 NTCS RF Output. * Composite Video and Stereo Audio Output. * Full Compliant with ATSC A/74, Receiver Performance Guidelines. * Support Channel Display, Closed Caption, EAS and Parental Control (V-Chip) * Full Compliant with Energy Standards. * Display ANT Level and Signal quality on the TV. If you have any questions about this product by Sansonic, contact us by completing and submitting the form below. If you are looking for a specif part number, please include it with your message.